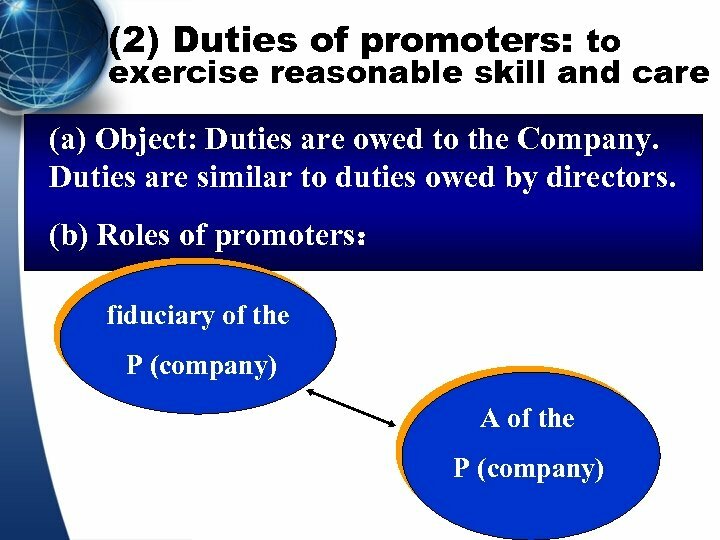 Learning Objectives: l l l a) Explain the role and duties of company promoters. 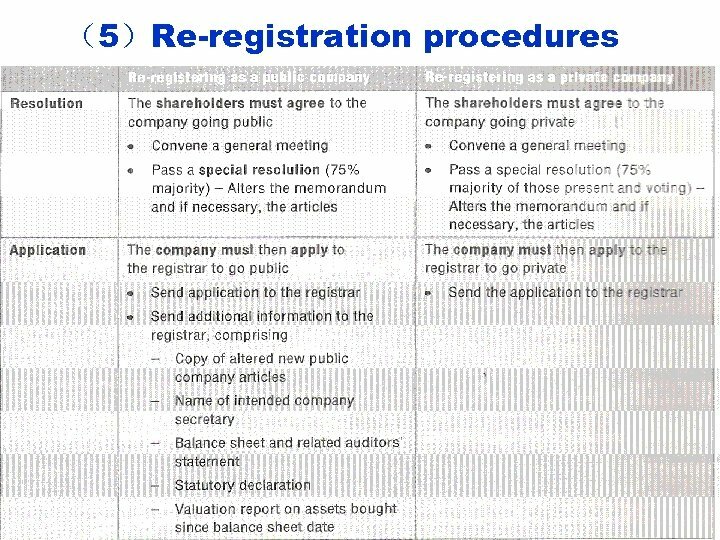 b) Describe the procedure for registering companies, both public and private. 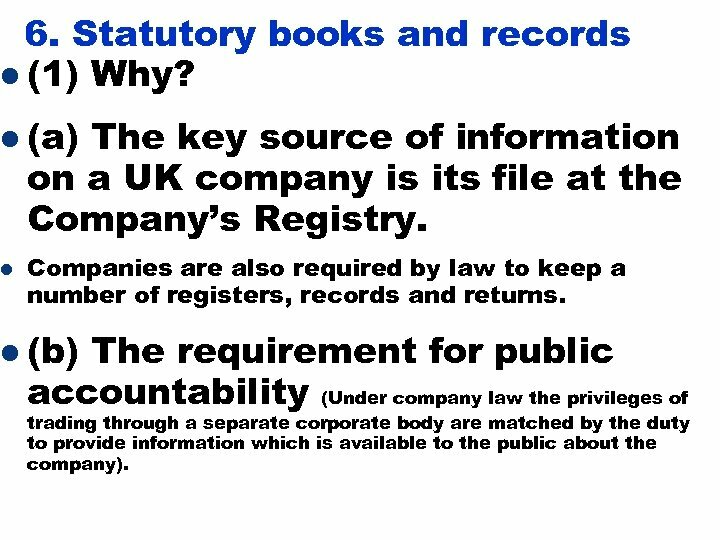 c) Describe the statutory books, records and returns that companies must keep or make. 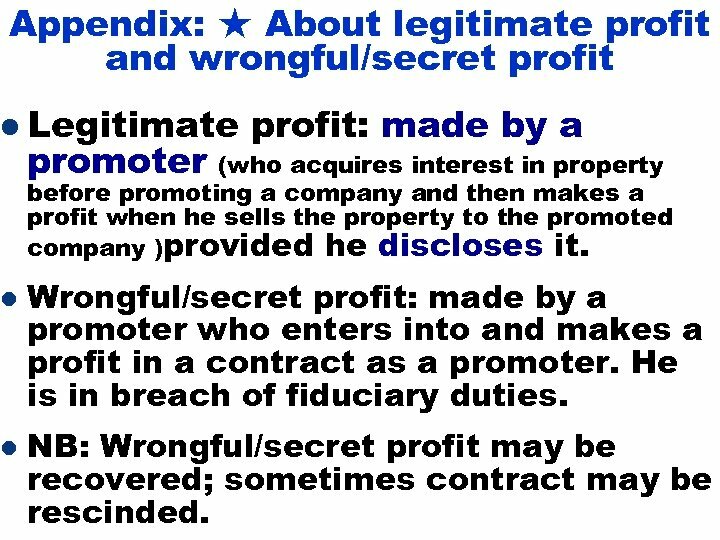 Appendix: ★ About legitimate profit and wrongful/secret profit l Legitimate l l promoter profit: made by a (who acquires interest in property before promoting a company and then makes a profit when he sells the property to the promoted company )provided he discloses it. Wrongful/secret profit: made by a promoter who enters into and makes a profit in a contract as a promoter. He is in breach of fiduciary duties. NB: Wrongful/secret profit may be recovered; sometimes contract may be rescinded. 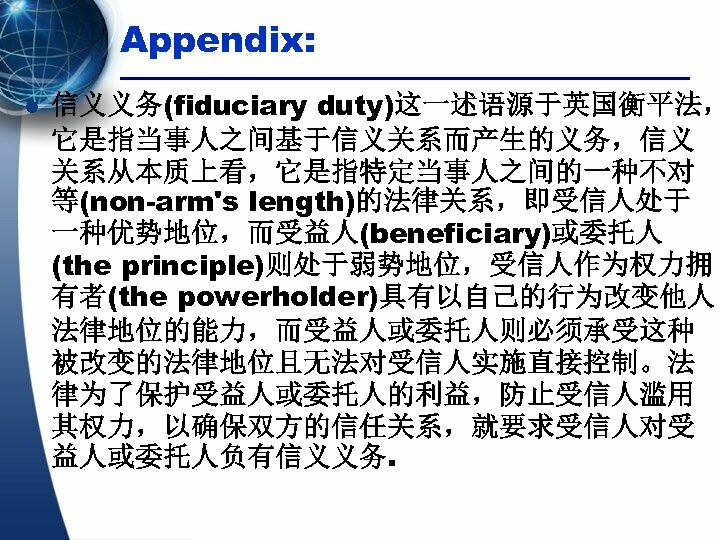 Appendix: l 信义义务(fiduciary duty)这一述语源于英国衡平法， 它是指当事人之间基于信义关系而产生的义务，信义 关系从本质上看，它是指特定当事人之间的一种不对 等(non-arm's length)的法律关系，即受信人处于 一种优势地位，而受益人(beneficiary)或委托人 (the principle)则处于弱势地位，受信人作为权力拥 有者(the powerholder)具有以自己的行为改变他人 法律地位的能力，而受益人或委托人则必须承受这种 被改变的法律地位且无法对受信人实施直接控制。法 律为了保护受益人或委托人的利益，防止受信人滥用 其权力，以确保双方的信任关系，就要求受信人对受 益人或委托人负有信义义务. 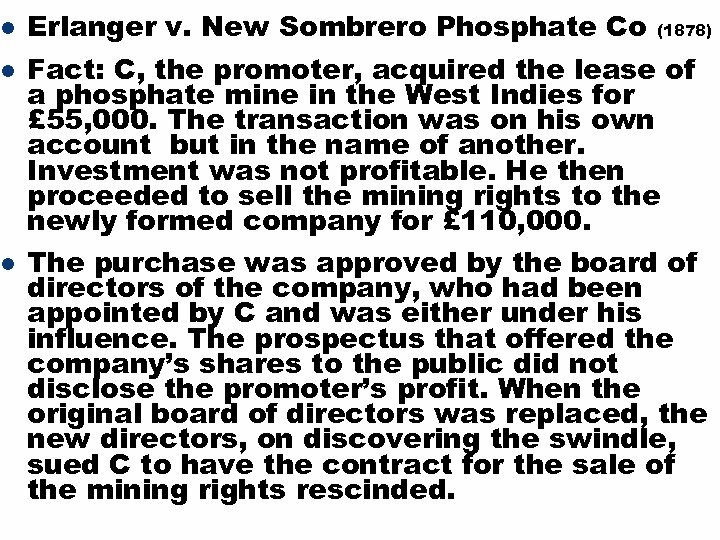 l l l Erlanger v. New Sombrero Phosphate Co (1878) Fact: C, the promoter, acquired the lease of a phosphate mine in the West Indies for £ 55, 000. The transaction was on his own account but in the name of another. Investment was not profitable. He then proceeded to sell the mining rights to the newly formed company for £ 110, 000. The purchase was approved by the board of directors of the company, who had been appointed by C and was either under his influence. The prospectus that offered the company’s shares to the public did not disclose the promoter’s profit. When the original board of directors was replaced, the new directors, on discovering the swindle, sued C to have the contract for the sale of the mining rights rescinded. l Held: the contract should be rescinded because the profit made by Chad not been properly disclosed (in this case to an independent board) and therefore could not be kept by him. Statute remedies l l l Person who suffers loss may seek compensation. Statutory and listing regulations together with rigorous investigation by merchant banks have greatly lessened the problem of the dishonest promoters. Recovery for false statements in disclosure document. 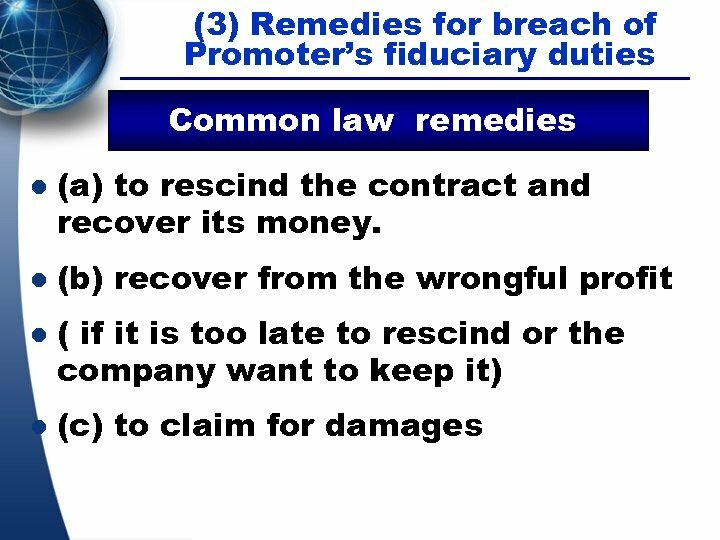 ( Applies to public companies) Promoter must not offer securities if there are misleading statements in offer document. Promoter must disclose any property acquired by company and any offer of securities to company. 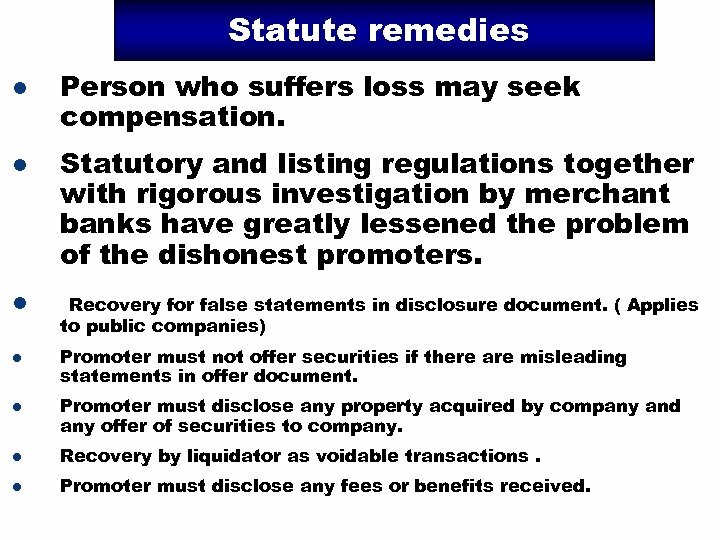 l Recovery by liquidator as voidable transactions. l Promoter must disclose any fees or benefits received. 2. 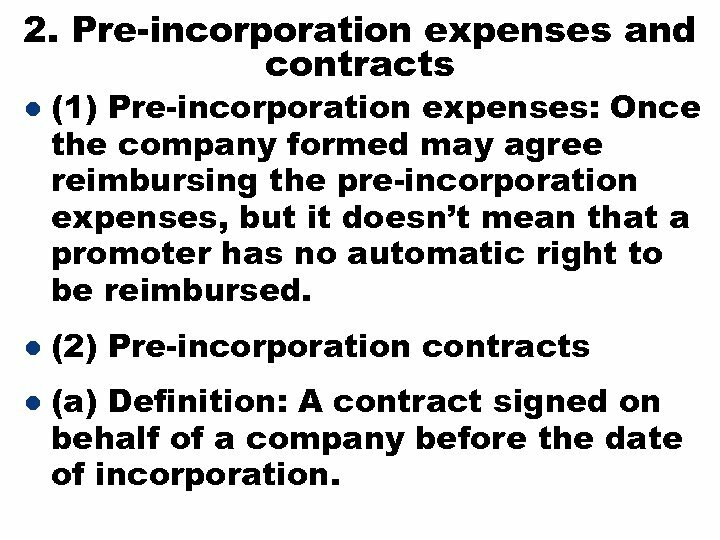 Pre-incorporation expenses and contracts l l l (1) Pre-incorporation expenses: Once the company formed may agree reimbursing the pre-incorporation expenses, but it doesn’t mean that a promoter has no automatic right to be reimbursed. 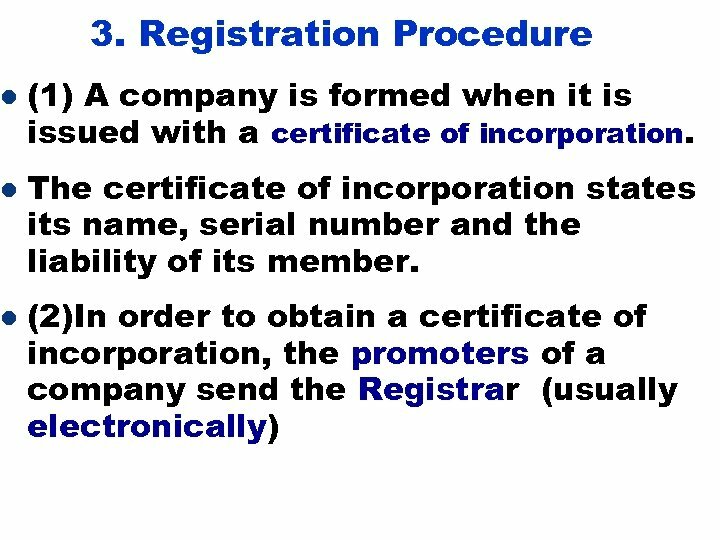 (2) Pre-incorporation contracts (a) Definition: A contract signed on behalf of a company before the date of incorporation. 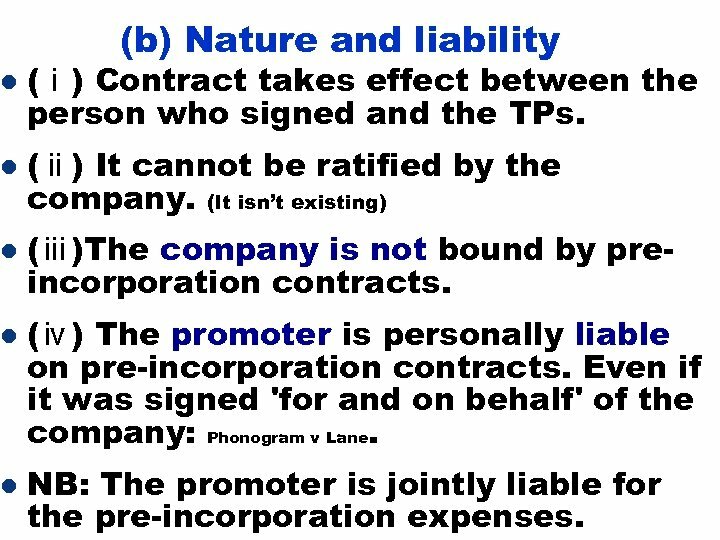 (b) Nature and liability l (ⅰ) Contract takes effect between the person who signed and the TPs. l (ⅱ) It cannot be ratified by the company. 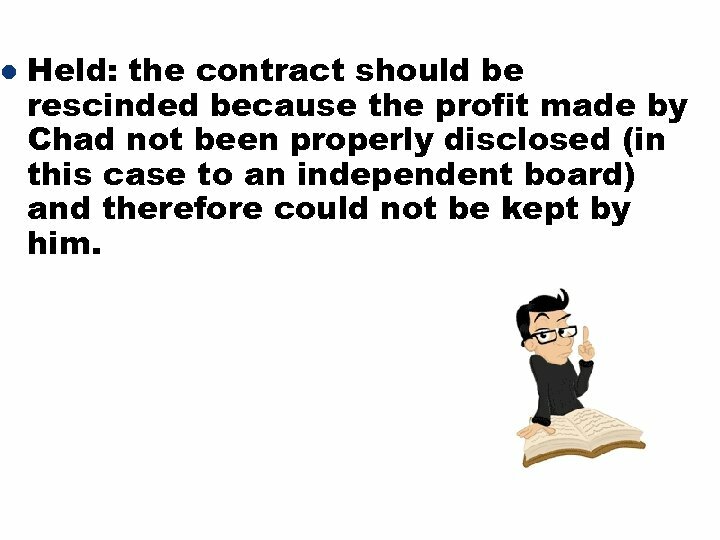 (It isn’t existing) l (ⅲ)The company is not bound by preincorporation contracts. 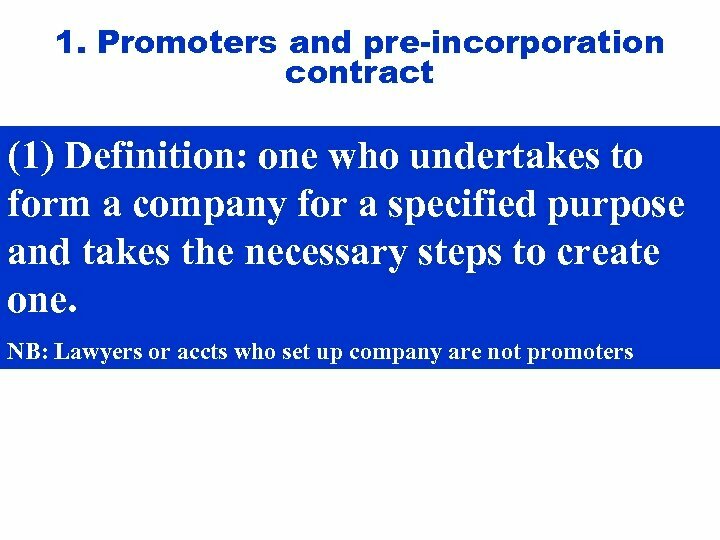 l l (ⅳ) The promoter is personally liable on pre-incorporation contracts. Even if it was signed 'for and on behalf' of the company: Phonogram v Lane. NB: The promoter is jointly liable for the pre-incorporation expenses. 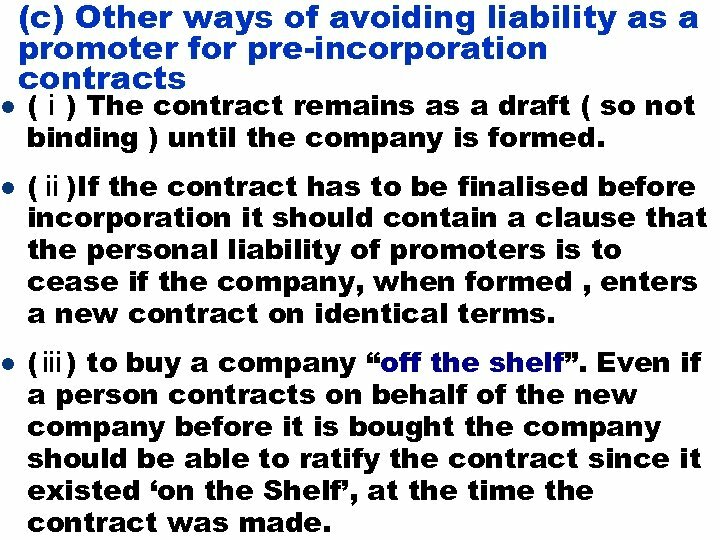 l l l (c) Other ways of avoiding liability as a promoter for pre-incorporation contracts (ⅰ) The contract remains as a draft ( so not binding ) until the company is formed. 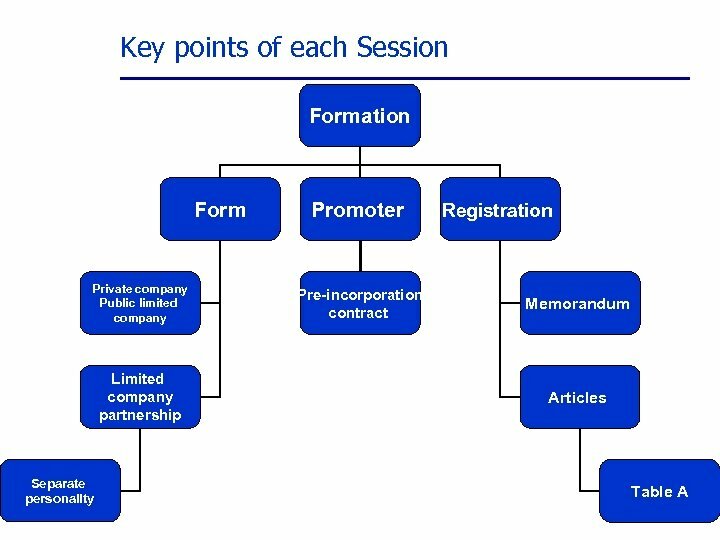 (ⅱ)If the contract has to be finalised before incorporation it should contain a clause that the personal liability of promoters is to cease if the company, when formed , enters a new contract on identical terms. 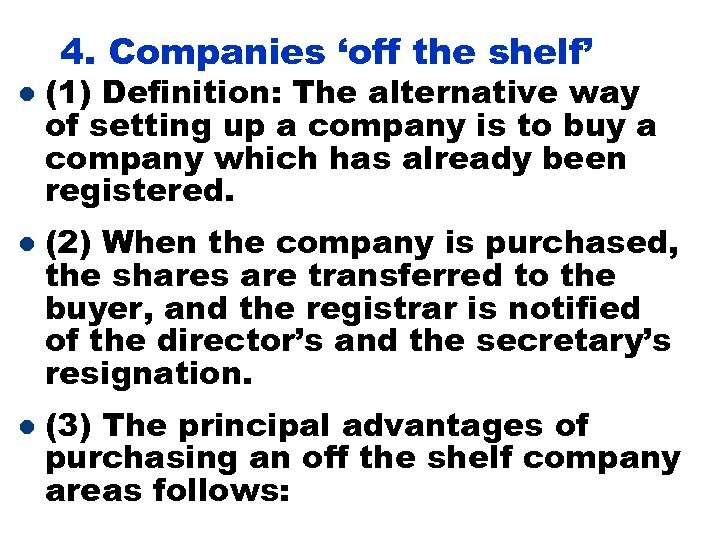 (ⅲ) to buy a company “off the shelf”. 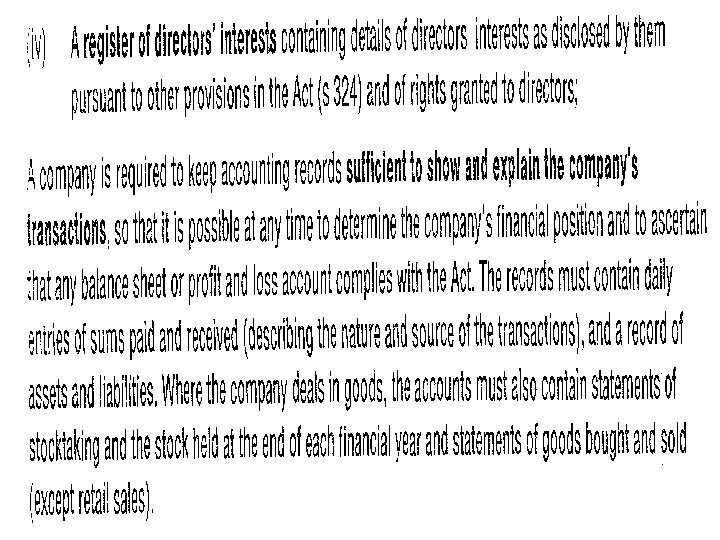 Even if a person contracts on behalf of the new company before it is bought the company should be able to ratify the contract since it existed ‘on the Shelf’, at the time the contract was made. 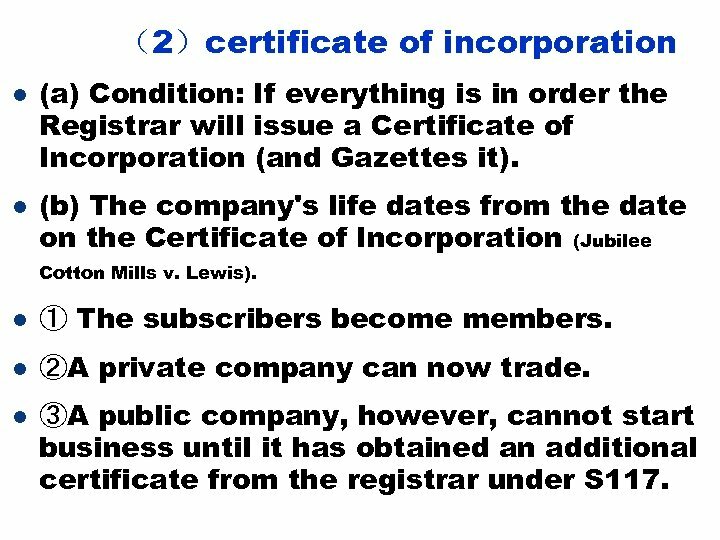 （2）certificate of incorporation l l (a) Condition: If everything is in order the Registrar will issue a Certificate of Incorporation (and Gazettes it). 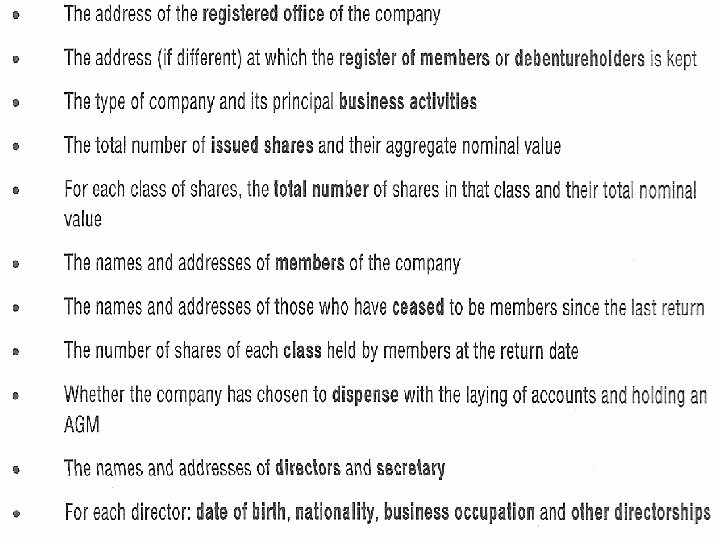 (b) The company's life dates from the date on the Certificate of Incorporation (Jubilee Cotton Mills v. Lewis). l ① The subscribers become members. l ②A private company can now trade. 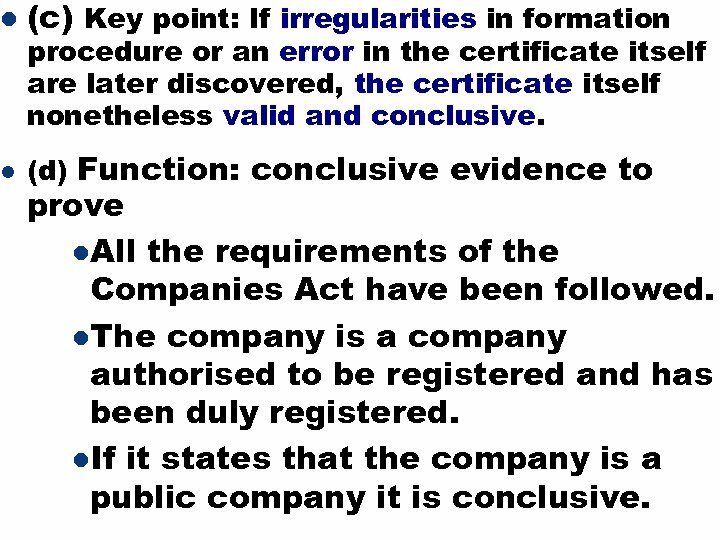 l ③A public company, however, cannot start business until it has obtained an additional certificate from the registrar under S 117.
l (c) Key point: If irregularities in formation l (d) Function: conclusive evidence to procedure or an error in the certificate itself are later discovered, the certificate itself nonetheless valid and conclusive. prove l. All the requirements of the Companies Act have been followed. 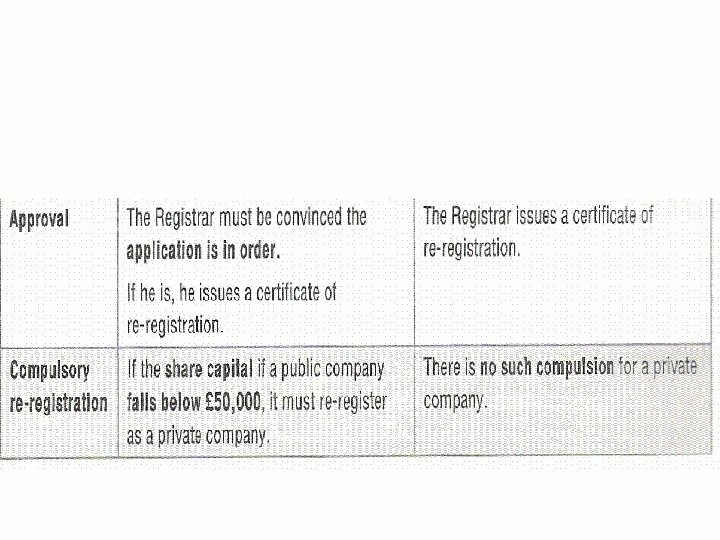 l. The company is a company authorised to be registered and has been duly registered. 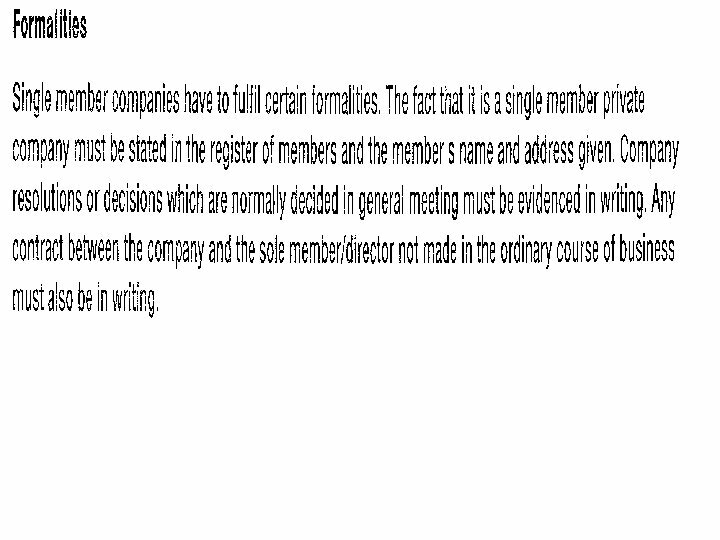 l. If it states that the company is a public company it is conclusive. l Answers: (a) Most of the advantages and l (b) Advantages l l l disadvantages of purchasing an off the shelf company relate to the formalities required to incorporate a company and to alter various details that relate to existing companies. 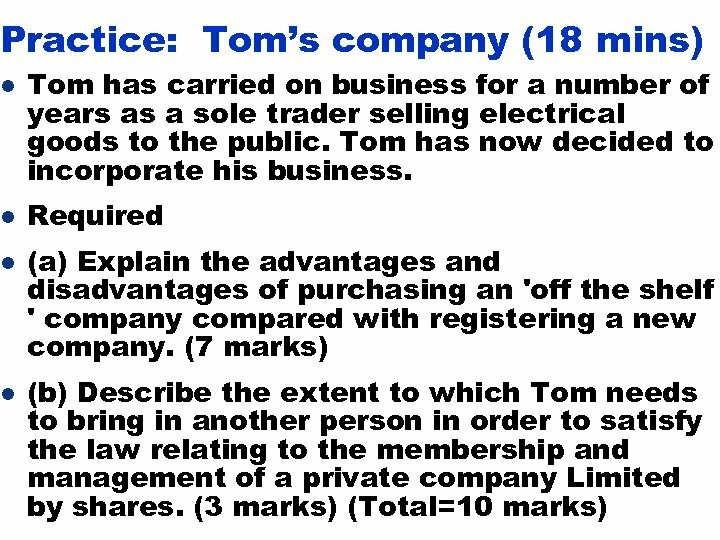 (ⅰ) Tom will not need to file the relating documents with the Registrar of company (memorandum and articles, statutory declaration ect). This will be a quicker and very possibly cheaper way of incorporating his business. 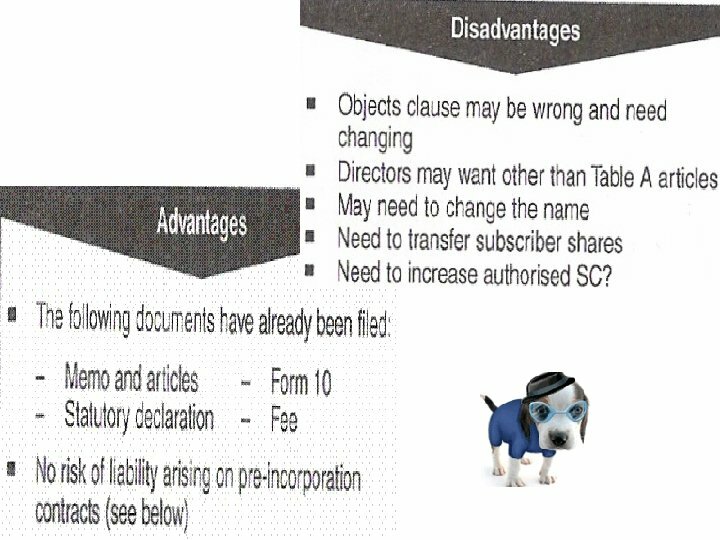 (ⅱ) This will be no risk of potential liability arising from pre-incorporation contracts. 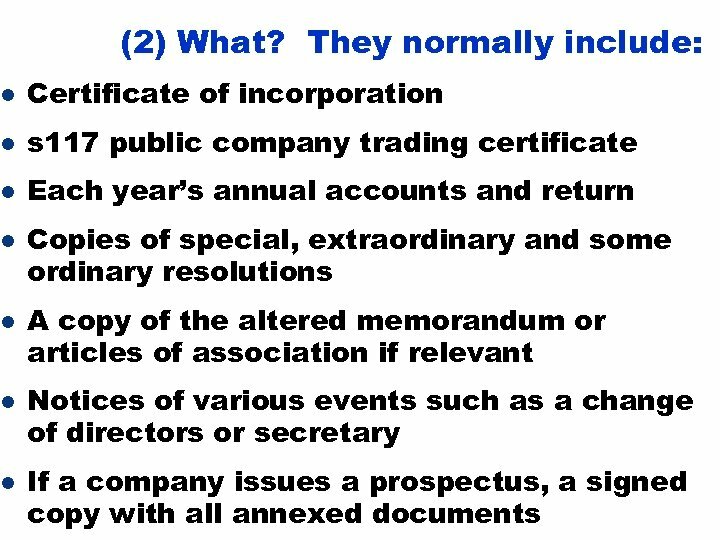 Tom can continue trading without needing to worry about waiting for the registrar’s certificate of incorporation. (ⅲ) The need to use the services of professionals will be decreased, making incorporation cheaper. 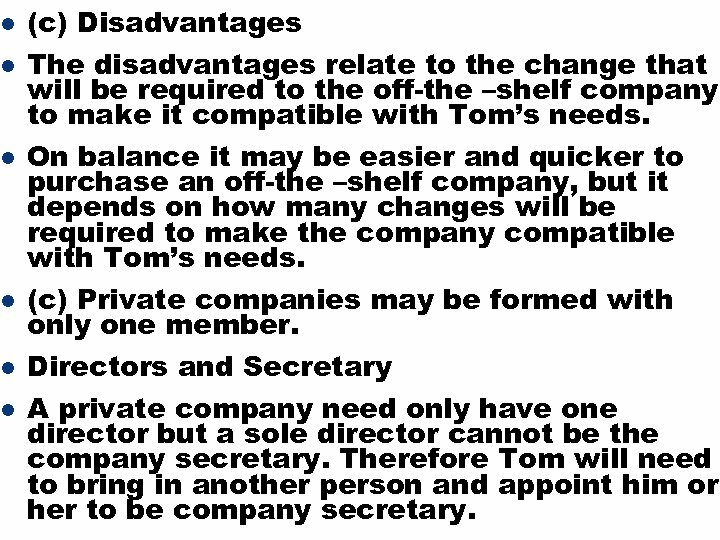 l l l (c) Disadvantages The disadvantages relate to the change that will be required to the off-the –shelf company to make it compatible with Tom’s needs. On balance it may be easier and quicker to purchase an off-the –shelf company, but it depends on how many changes will be required to make the company compatible with Tom’s needs. 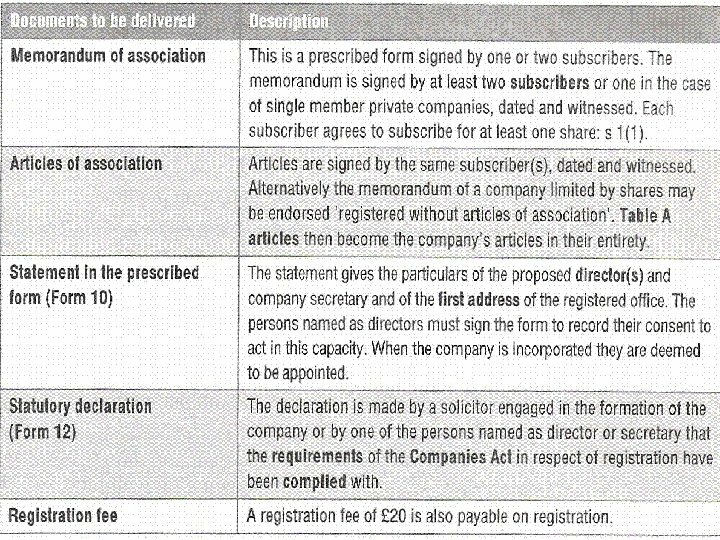 (c) Private companies may be formed with only one member. Directors and Secretary A private company need only have one director but a sole director cannot be the company secretary. Therefore Tom will need to bring in another person and appoint him or her to be company secretary. 6. 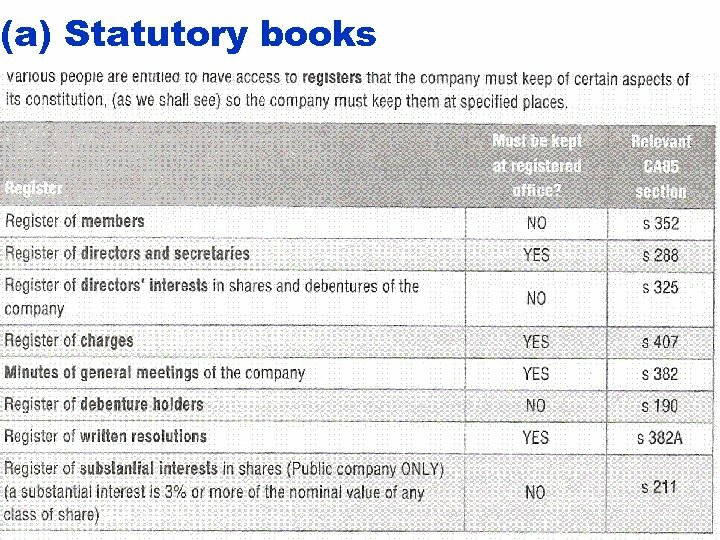 Statutory books and records l (1) Why? l (a) l The key source of information on a UK company is its file at the Company’s Registry. 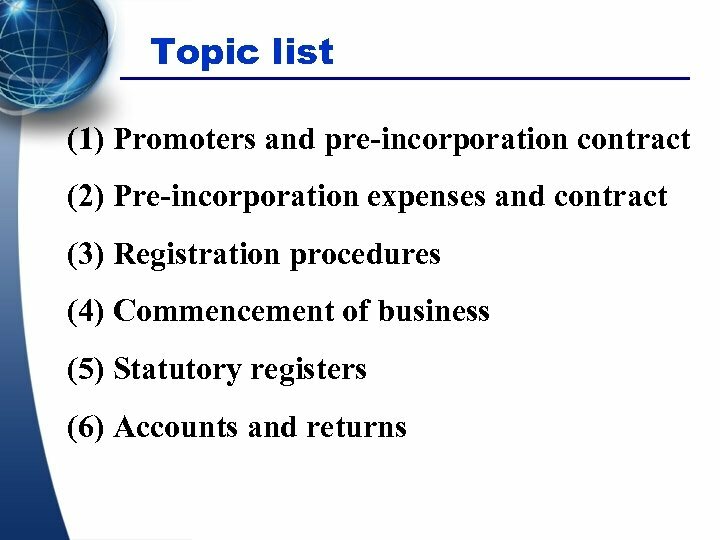 Companies are also required by law to keep a number of registers, records and returns. l (b) The requirement for public accountability (Under company law the privileges of trading through a separate corporate body are matched by the duty to provide information which is available to the public about the company). 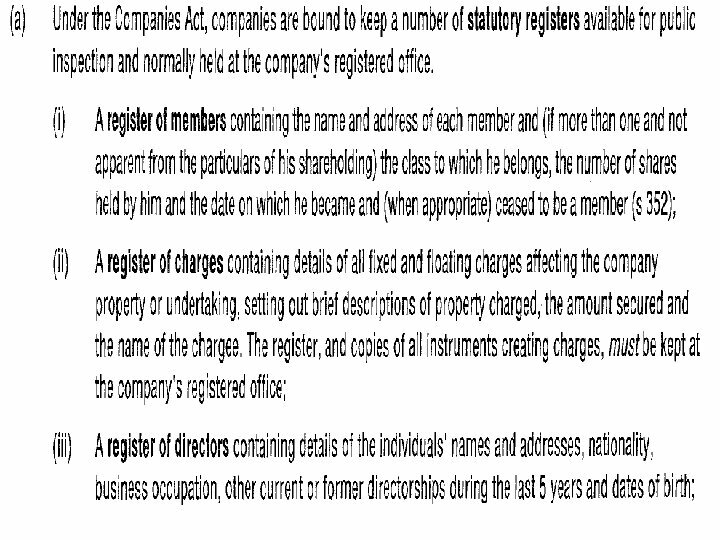 l l l (c) Statutory returns Every company must make an annual return to the Registrar annually giving details of director, secretaries and shares. 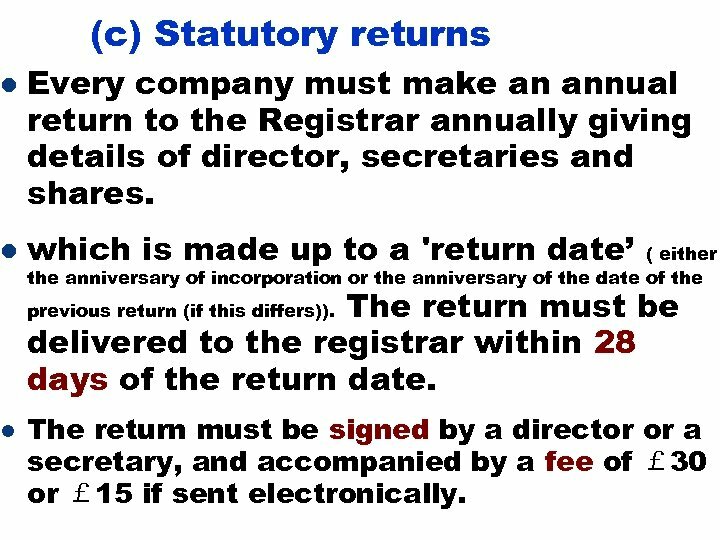 which is made up to a 'return date’ ( either the anniversary of incorporation or the anniversary of the date of the The return must be delivered to the registrar within 28 days of the return date. previous return (if this differs)). The return must be signed by a director or a secretary, and accompanied by a fee of ￡ 30 or ￡ 15 if sent electronically. 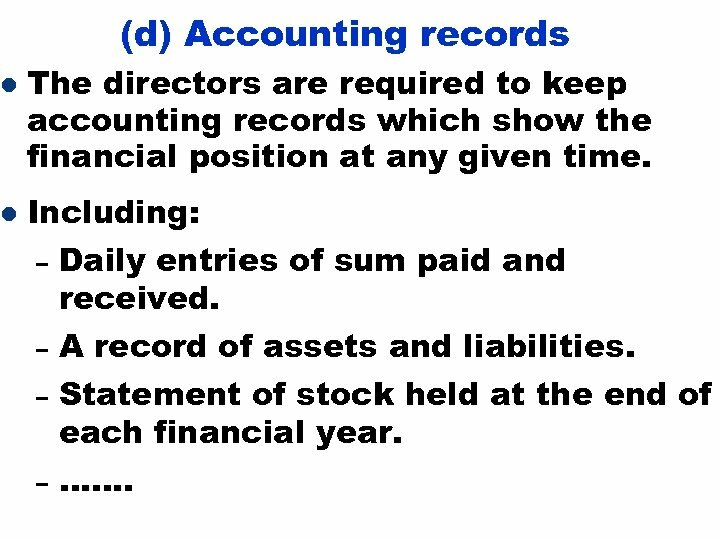 l l (d) Accounting records The directors are required to keep accounting records which show the financial position at any given time. Including: – Daily entries of sum paid and received. – A record of assets and liabilities. – Statement of stock held at the end of each financial year. – ……. 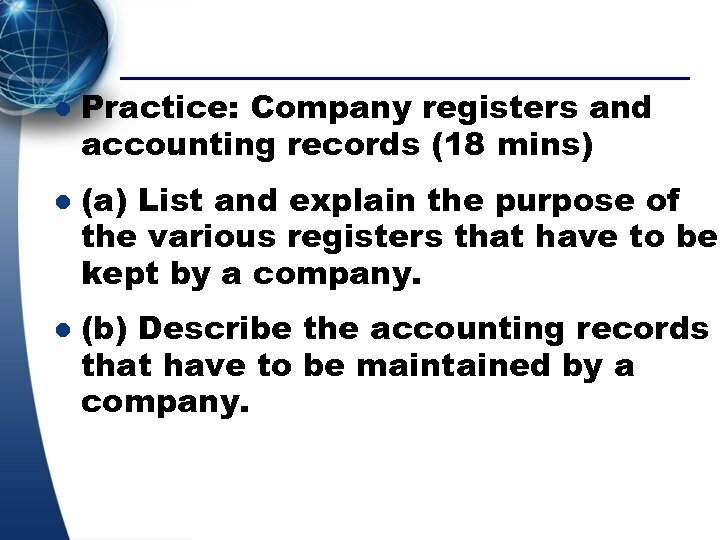 l l l Practice: Company registers and accounting records (18 mins) (a) List and explain the purpose of the various registers that have to be kept by a company. 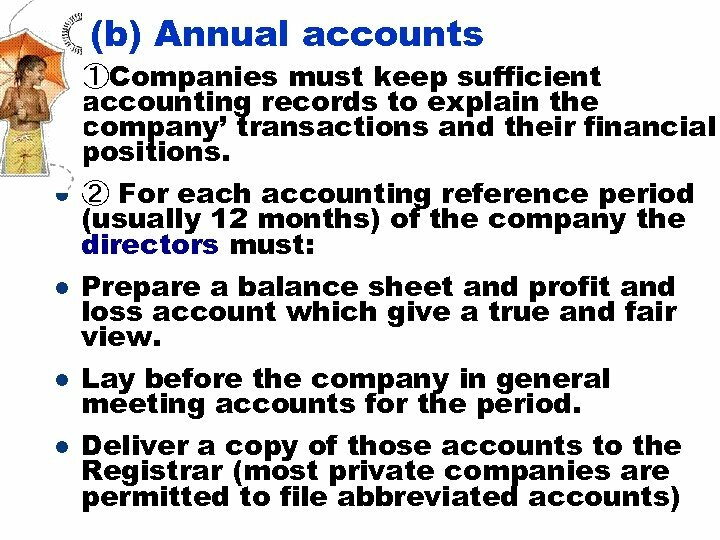 (b) Describe the accounting records that have to be maintained by a company. 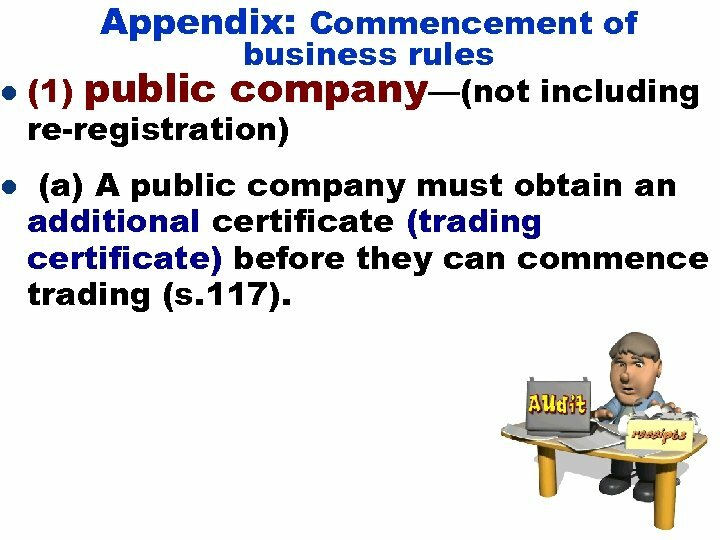 Appendix: Commencement of business rules l (1) public company—(not including re-registration) l (a) A public company must obtain an additional certificate (trading certificate) before they can commence trading (s. 117). 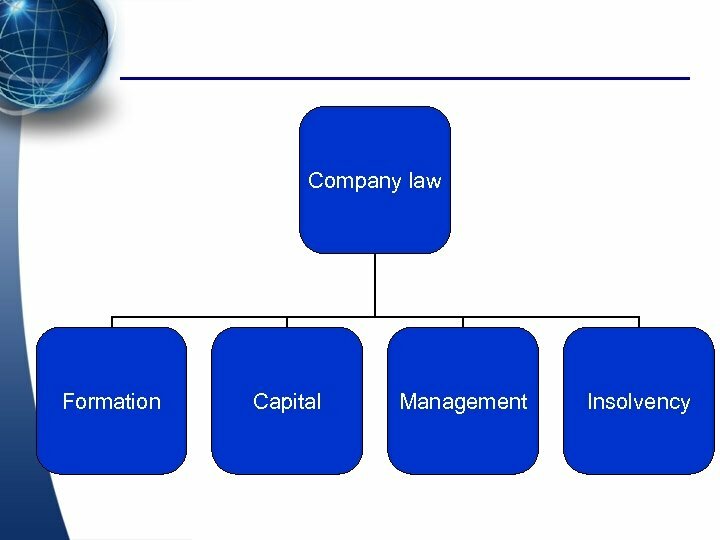 l (b) A public company must provide three extra details to the Registrar: l (i) share capital. l l l (ii) preliminary expenses. 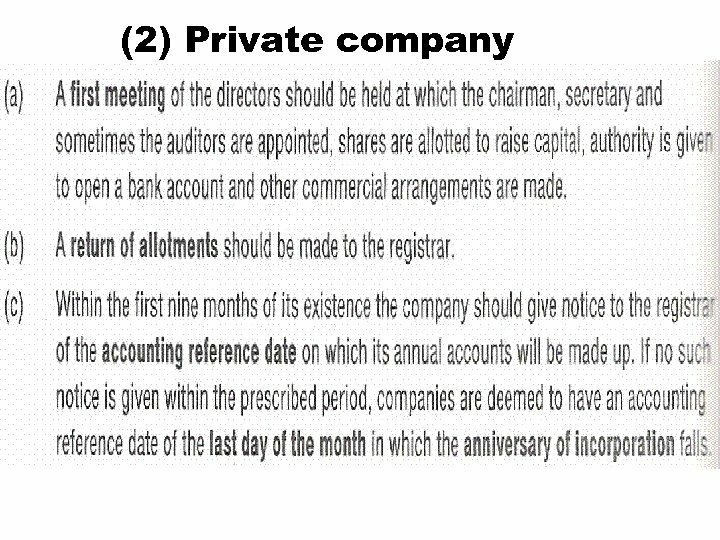 (iii) amount due or paid to promoters (iv) The nominal value of the allotted share capital is not less than ￡ 50, 000 The amount paid up on the allotted share capital , which must be at least one quarter of the nominal value and the entire premium if any；effectively this imposes a minimum of paid up capital of ￡ 12, 500. 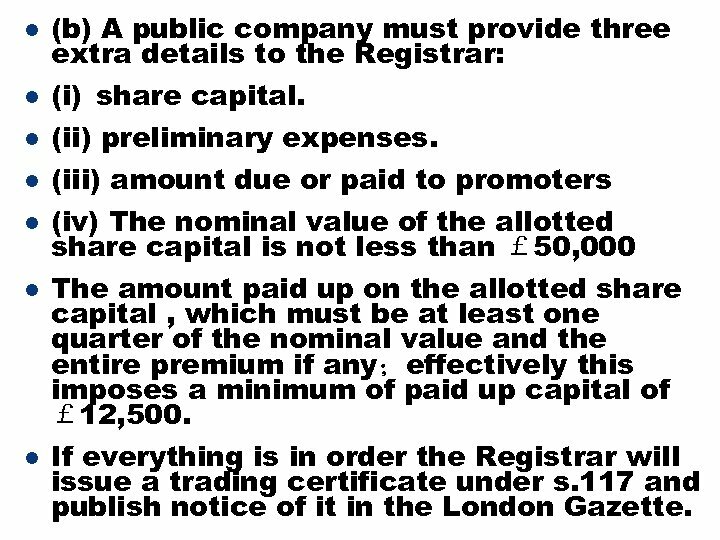 If everything is in order the Registrar will issue a trading certificate under s. 117 and publish notice of it in the London Gazette. 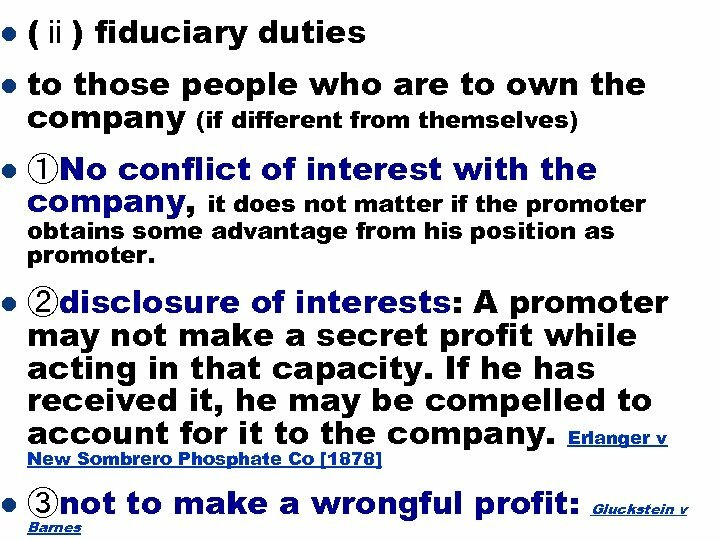 l l l (c) If a public company starts trading without satisfying s. 117 there are four consequences: (i) The company is primarily liable. 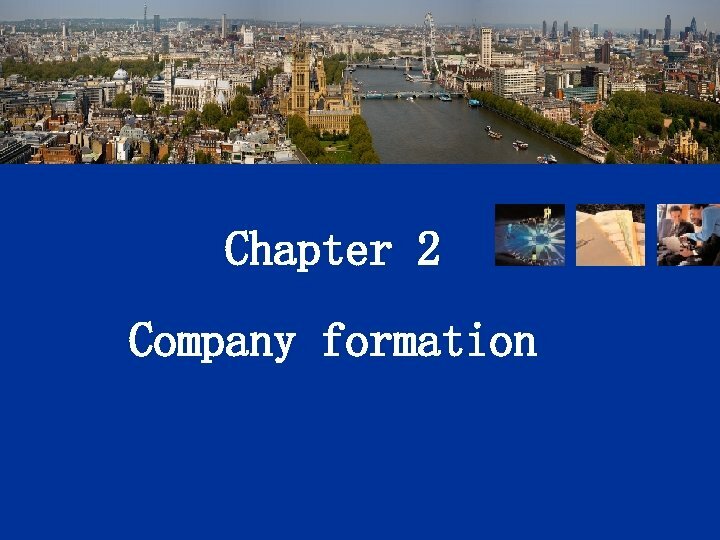 (ii) If the company does not meet its liabilities within 21 days of demand being made, the directors have personal liability. 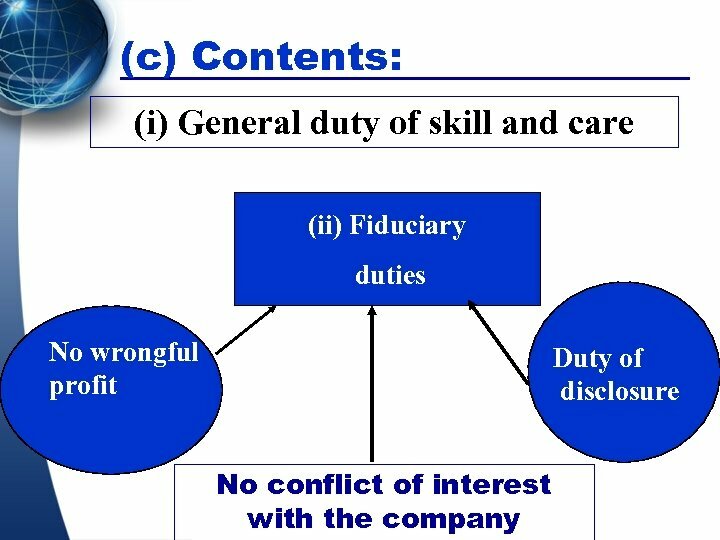 (iii) The company and its officers are liable to a fine. 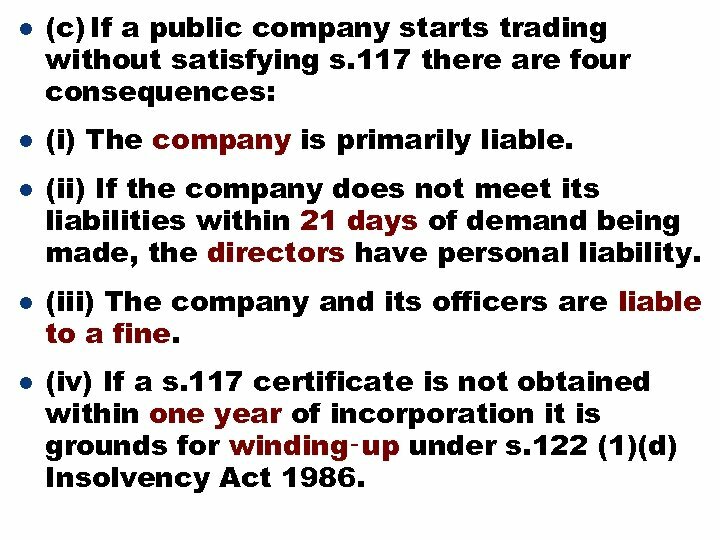 (iv) If a s. 117 certificate is not obtained within one year of incorporation it is grounds for winding‑up under s. 122 (1)(d) Insolvency Act 1986.
l l NB: What is the outcome if a public company does business or borrows before obtaining a certificate? The other party is protected since the transaction is valid. 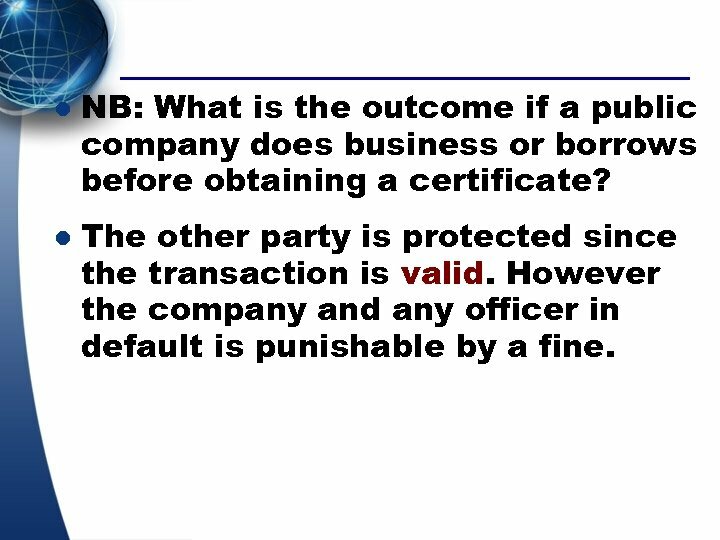 However the company and any officer in default is punishable by a fine.